It was the Cadillac CTS sedan that brought Cadillac into its modern era, past the Broughams and Fleetwoods your grandparents drove and into BMW-fighting high performance. In V form especially it brought a ton of horsepower to the table with wonderful results, but at the end, sales were dreadfully slow—leaving Cadillac to focus more on SUVs and crossovers. But it hasn’t given up the sedan game entirely. Meet the CTS’ modern replacement, the Cadillac CT5. 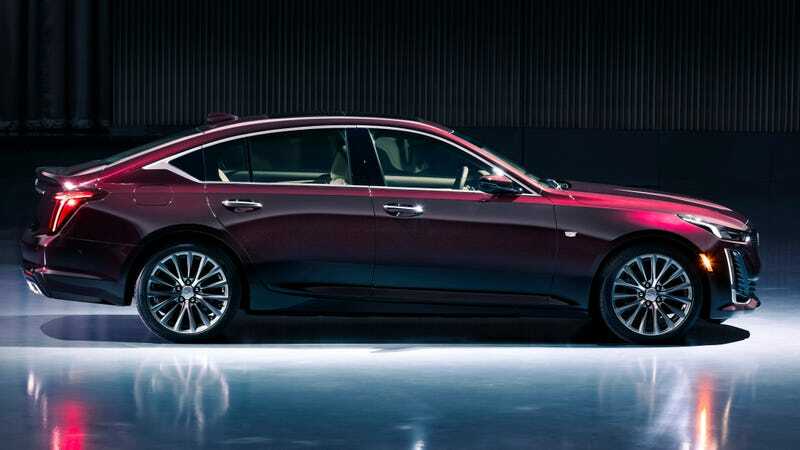 This is the second sedan to adopt Cadillac’s newest alphanumeric naming system, behind the bigger, more expensive and eventually-fated-to-die CT6. With any luck it’ll sell better than the CT6 did, and live up to the CTS’ legacy—that was always a favorite with enthusiasts, including ones at the Jalopnik office. The XT crossovers have been using those names for a while. It’s a nice design, and a solid evolution of what the CTS started. I wasn’t sure about that oddly shaped C-pillar, but it definitely looks better with chrome trim in the topshot instead of black like immediately above. In terms of technical specs, Cadillac says this car uses the latest iteration of the rear-wheel drive Alpha platform that underpins the Camaro and the outgoing CTS and ATS. That was expected, and great news for enthusiasts—that’s one of the best sporting vehicle architectures around, and every car that uses it happens to be a superb handler. All-wheel drive is optional as well. No word on horsepower for either of these, but Cadillac says the CT5 will use a turbocharged 2.0-liter four-cylinder engine and a twin-turbo 3.0-liter V6 engine. Those are rated at 237 and 404 HP, respectively, when used on the CT6, so expect similar results here. The 3.6-liter naturally aspirated V6 appears to be gone from the lineup. Like other Cadillacs of late it’ll be offered in Luxury and Sport trims, depending on what buyers want more of. If the CT6 is any indication, it should up its interior game too. That was always an issue with the last generation of Cadillac sedans. Cadillac chose to reveal the car in a series of ASMR videos, a move that’s sure to age well, but we’ll see the real thing next month at the New York Auto Show. I’m eager to see it in person, and bring on the inevitable V version as well. But will buyers greet this thing more warmly than they did the CTS at the end? We’ll see.